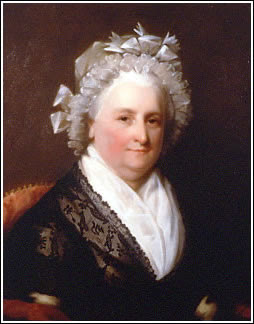 Far be it from me to criticize the mother of our nation, but that Martha Washington was not a looker in the least bit. Not that George Washington was exactly Brad Pitt or anything himself. With parents like those two, it's no wonder America is such an ugly nation! I don't know that I had ever really seen a picture of Mrs. Washington before we were in a museum in Philadelphia on our trip last week. As boy child and I were working our way through the photo gallery in this museum, we came across the picture below, and we let out a collective grunt of disgust. Stickman Musings' extensive research department, commonly referred to as Wikipedia, has informed me that old Georgie boy got him a Sugar Mama by marrying her. Martha was loaded! Of course, in those days, money (AKA land and slaves) was far more important than looks. I don't know if you've seen paintings of people back then, but it was a pretty well known fact that everyone was ugly. With this revelation of Martha's ugliness, it is no surprise that George was boinking the slave girls. He clearly had no choice. Way to give an excuse to the Father of our Nation, even if it is a valid one.